You know how there are some players where you’re just like “Man, I could just sit and that that dude goof off, like, forever.” Well, here you go. An epic trick dump from Polo Garbkamol to show off his new signature model from YoYoFactory, and instead of a typically fast-paced product video it’s just Polo kicking back and cruising through 5+ minutes of solid tricks. So good. Put it on repeat. Yoyo used is the YoYoFactory Marco. It’s a sad day for many generations of “Toys R Us Kids”. Six months after filing for bankruptcy in the US (and one month after filing in the UK), Toys R Us announced will be closing all 900 stores across the United States and the UK. Toys R Us is one of, if not the largest single retailer for yoyo brands like Duncan, YoYoFactory, and Yomega so this is going to be a huge hit for those companies. Gift cards will be honored in the US for the next 30 days, and we expected liquidation pricing to go into effect soon. It will be a good time to pick up plenty of great yoyos for cheap for your local club, but that’s about the only silver lining we can find here. It's only February and Fist Salud already released the video of the year. Now what is everyone else supposed to do? I guess just kick back and enjoy watching 4x World Champion Shu Takada reinforce that he really is one of the most talented and creative yoyo players of all time. Yoyo used is the YoYoFactory Loop 2020. It’s only February and Fist Salud already released the video of the year. Now what is everyone else supposed to do? I guess just kick back and enjoy watching 4x World Champion Shu Takada reinforce that he really is one of the most talented and creative yoyo players of all time. Yoyos used are the YoYoFactory Loop 720 and an unnamed YoYoFactory prototype. Cyber Monday Sale At YoYoExpert.com! It’s here! YoYoExpert’s Cyber Monday sale happens all day Monday AND Tuesday! 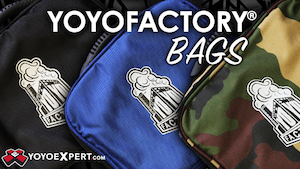 Save up to 50% (or even more) on products from YoYoFactory, YoYoRecreation, Duncan Toys, Something, C3yoyodesign, Turning Point, and more! Plus, buy ANY Side Effect yoyo from OneDrop and get a pair of Side Effects for just $3.99! Head over to YoYoExpert.com and take advantage of these deals while supplies last! Gentry Stein stands on the steps of Freedom House. Panmungak North Korea behind him. Photo by Ben McPhee. YoYoFactory is known for a lot of things…great yoyos, a massive selection, and an incredible team of sponsored players. And in recent years they’ve become the ultimate yoyo travel company, bringing their players to the most exotic of locations for tricks, good times, and incredible photos and footage. Their most recent adventure didn’t find anyone throwing yoyos though, since it would increase their chances of getting shot. North Korea is now off limits to US citizens. Visitors from other nations can access it via China and we know a number of people who have visited in the last 2 years. None of them recommended going. Since the capture and ultimate death US tourist Otto Warmbier its something we wouldn’t consider doing…. but there is another way to visit. Its safe they say. Organized tours leave Seoul daily shuttling camera toting tourists to the DMZ (demilitarized zone). This area is 6km back from where the battle line was when a ceasefire on the Korean Peninsula was called in 1953. Roughly following the 38th parallel, the DMZ stretches almost 150-mile-long. Located within the territory is the “truce village” of P’anmunjom here North Korean and American soldiers stand face to face. This is part of the Joint Security Area (JSA) which is used by the two Koreas for diplomatic engagements and, until March 1991, was also the site of military negotiations between North Korea and the United Nations Command (UNC). Now its is used for posturing. Loud speakers blare propaganda, both directions. While the military stands face to face, guns ready. So do tourists. From the South and North. Head over to YoYoFactory.com and check this out. And hats off to Ben and Gentry for bringing us all along for such an amazing journey! WOO HOO! Polo Garbkamol stomped down his judge's audition on the first episode of Asia's Got Talent 2017, moving him along to the next round! Can't wait to see what he does in the next round...even in this first round he didn't exactly play it safe and went for a few risky moves. Yoyo used is the YoYoFactory Horizon. WOO HOO! Polo Garbkamol stomped down his judge’s audition on the first episode of Asia’s Got Talent 2017, moving him along to the next round! Can’t wait to see what he does in the next round…even in this first round he didn’t exactly play it safe and went for a few risky moves. 2017 US National YoYo Contest – 3A – Alex Hattori Wins! Congratulations to Alex Hattori, the 2017 US National YoYo Contest 3A Champion! 2017 US National YoYo Contest – 1A Division – Evan Nagao Wins! Congratulations to Evan Nagao, the 2017 US National Champion in the 1A Division! Shu Takada is one of the most talented yoyo players of his generation. Natural talent combined with thousands of hours of hard work have made him a World Champion several times over, but it's his creativity and almost effortless trick delivery that keeps us coming back for more. Yoyo used is the YoYoFactory Loop 2020. Shu Takada is one of the most talented yoyo players of his generation. Natural talent combined with thousands of hours of hard work have made him a World Champion several times over, but it’s his creativity and almost effortless trick delivery that keeps us coming back for more. Yoyo used is the YoYoFactory Loop 2020. Bogdan Bezugliy turns in some crazy dense tricks in his new video, and that bind at 0:55 is straight up glorious. Yoyo used is the YoYoFactory Bi-Metal Superstar. Bogdan Bezugliy turns in some crazy dense tricks in his new video, and that bind at 0:55 is straight up glorious. Yoyo used is the YoYoFactory Bi-Metal Superstar.